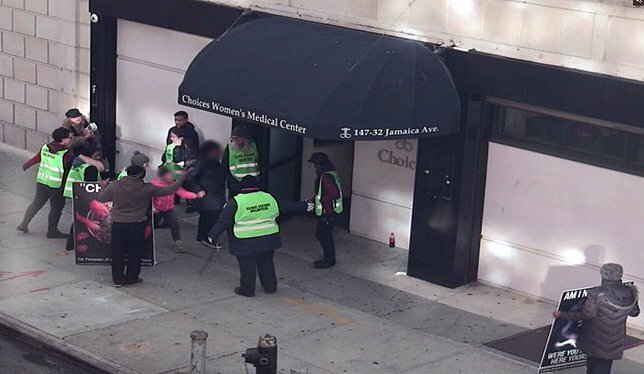 AG’s Lawsuit Documents History Of Protesters’ Threatening, Violent, And Obstructive Behavior, Aimed At Blocking Women’s Access To Choices Women’s Medical Center; AG Seeks 16-Foot Buffer Zone Around Clinic. Anti-choice protests outside Choices Women’s Medical Center in Jamaica, Queens. New York, NY - June 20, 2017 - Today, New York Attorney General Eric T. Schneiderman announced a federal lawsuit against a coalition of anti-choice protesters who repeatedly harassed, threatened, and menaced patients, families, escorts, and clinic staff at the Choices Women’s Medical Center (“Choices”) in Jamaica, Queens. The lawsuit and motion for a preliminary injunction against the protesters, as well as anyone acting in concert with them, alleges violations of federal, state, and local laws, and are the result of an investigation initiated by Attorney General Schneiderman in June 2016 with the cooperation of Choices – an outpatient surgery center that provides medical services for women, including abortion – following complaints of the protesters’ extremely aggressive behavior. Click here for video of the anti-choice protests outside Choices. Attorney General Schneiderman’s lawsuit and preliminary injunction motion seek to enjoin the defendants from engaging in the unlawful conduct, and create a sixteen-foot buffer zone around the Choices premises to protect the rights and safety of patients, staff, and volunteers, in addition to seeking damages, penalties, costs, and attorney’s fees. The lawsuit, filed in the United States District Court for the Eastern District of New York today, alleges that every Saturday morning for at least five years, an aggressive group of anti-choice protestors, and those acting in concert with them, have tried to impede access to reproductive health care services by subjecting incoming patients to a barrage of unwanted physical contact, as well as verbal abuse, threats of harm, and lies about the clinic’s hours and its services. Among its allegations, the suit maintains that these protestors descend on approaching patients, sometimes walking them into the clinic’s exterior wall and pinning them against it. Protestors are alleged to crowd patients arriving by car, using their bodies to block the passenger-side doors and thrust their heads and hands through any open windows. Protestors are also alleged to deliberately collide into the volunteer escorts, and sometimes push and shove them, as the escorts try to shield patients from this unwanted physical contact and vitriol. These anti-choice protestors are also alleged to make violent threats against both the escorts and patients, referring to terrorist attacks and murderous assaults on abortion clinics, and warning that the same fate may befall them. These obstructive tactics routinely deter or delay patients who are attempting to access medically necessary care, as detailed in the Attorney General’s lawsuit. The Attorney General’s claims are brought under the federal Freedom of Access to Clinic Entrances Act (“FACE”), the New York State Clinic Access Act (“NY Clinic Access Act”), and the New York City Access to Reproductive Health Care Facilities Act (“NYC Clinic Access Act”), all of which prohibit obstructing access to reproductive health clinics. Menacing clinic staff members by informing them their names are on a website devoted to anti-abortion activity, and that the protester could remove their names from the website provided that the staff member cease working at Choices. Today’s lawsuit follows a number of actions taken by Attorney General Schneiderman to protect women’s access to health care, including obtaining court-ordered protections for a Planned Parenthood clinic in Utica. The Civil Rights Bureau of the Attorney General's Office is committed to protecting the reproductive health access of all New Yorkers. To file a civil rights complaint, contact the Attorney General’s Office at (212) 416-8250, civil.rights@ag.ny.gov or visit www.ag.ny.gov. The case against the protestors is being handled by Assistant Attorney Generals Nancy Trasande and Sandra Pullman of the Civil Rights Bureau. The Civil Rights Bureau is led by Lourdes Rosado, under the supervision of Executive Deputy Attorney General for Social Justice Alvin J. Bragg. "No one should be forced to endure threats, intimidation, or harassment when seeking medical care,” said Council Member Helen Rosenthal (Manhattan, District 6). “As Co-Chair of the City Council's Women's Caucus and a strong advocate for women's rights, I applaud Attorney General Eric Schneiderman for stepping up and taking action to protect New Yorker's access to reproductive health care." “I have been on the front lines of this struggle for women's rights and women's freedom for nearly fifty years. I have endured bomb threats, death threats, multiple evictions and the maiming and murder of colleagues and friends. And I am still here, because I made a vow to my first patient and to myself--that I would always be there for women and girls who came to me for services. I stand with A.G. Schneiderman and his staff—and with all abortion providers and patients—to say that this injustice must stop,” said Merle Hoffman, the Founder, President and CEO of Choices Women’s Medical Center. Subject: LongIsland.com - Your Name sent you Article details of "A.G. Schneiderman Files Lawsuit To End Persistent Harassment Of Women Entering Women's Health Clinic In Queens"